Creative Space offers astronomy outreach and public engagement for anyone who thinks space is awesome and wants to find out how it works! Our mission is to educate, inspire and enthuse our audiences by sharing our passion for space. Using our unique mix of creativity, knowledge and experience, we seek to offer the highest quality learning resources available and to influence the next generation of space scientists. Creative Space Science CIC (Creative Space for short) is a Community Interest Company developed to communicate those sometimes difficult-to-explain concepts in the Universe we live in. 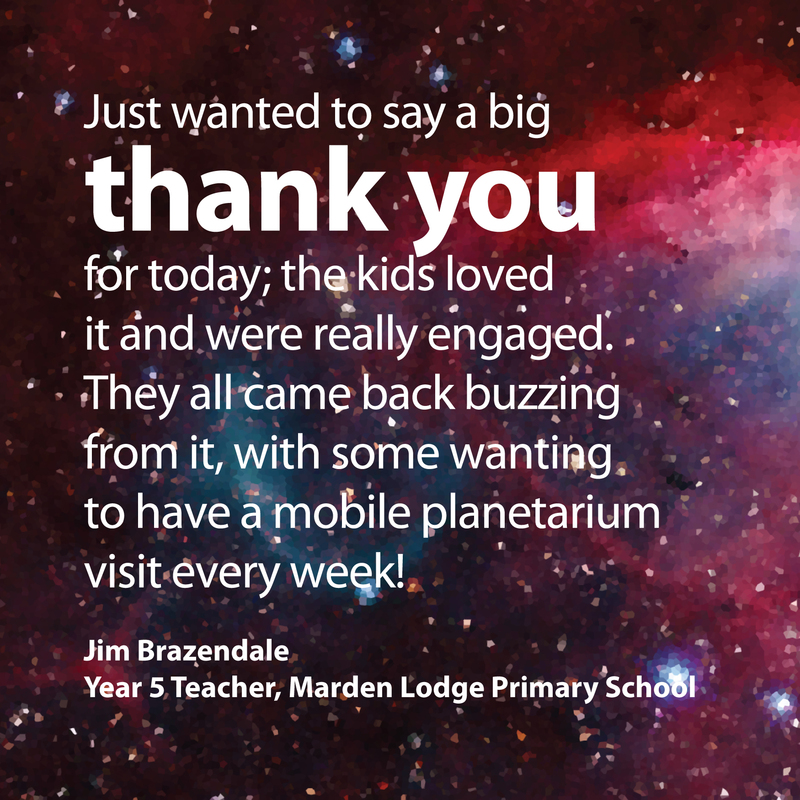 Whether it’s an informal talk without the astro-jargon, interactive workshop, or out-of-this-world planetarium show, we deliver subject-specific or topical activities with knowledge and vigour. We use astronomy professionals as our presenters, offering very specific knowledge of astronomy, planetary science and space exploration. After a first career in the creative industries, our Founder and Science Director, Melanie Davies, studied Physics and Natural Science at the Open University and went on to study Astrophysics at the University of Sussex. She’s worked for many years as a Space Science Communicator, many of those years at the historic observatory at Herstmonceux, and loved every minute of it. In 2015, when studying for a Masters Degree, Melanie followed her dream and set up Creative Space. Like the Universe, the company has grown from a seed of an idea into a big reality and continues to expand today. Melanie was elected a Fellow of the Royal Astronomical Society in 2014 and has a boundless passion for all things Space; her enthusiasm for the subject is palpable. With her background in art and design, she’s developed a trademark style, delivering her cosmic message through awesome graphics and truly creative techniques. Melanie and her growing squad of astro geeks now inspire thousands of children and grown ups every year. From an embryonic start, Creative Space has evolved to become a go-to resource for all kinds of space education and fun. Together, the Creative Space team continue to develop new projects and ideas for bringing space science to life. And the future? We’re working on a range of concepts including community projects and franchised space workshops. We’ve already received funding from a range of hugely generous donors and continue to seek funding opportunities to step up our free astronomy outreach and public engagement projects. Watch this space!